That is really cute. It would go well with the decor in my parent's house. I love everything purple! The pillow is very cute. What a beautiful pillow. Purple is one of my favorite colors. I love the idea of the pillow. I love purple, but it's not the theme in our house. I could see this in a different color. Great pillow. I love the shabby chic look of the pillow! It would be perfect in my sitting room. Very pretty! Would look lovely in a sun room or beautiful girl room! Love the design, does it smell like lavender too? This would make a nice addition to a couch! That is a beautiful pillow. I don't know if I would like my name on it though. I love lavendar. This would be a great addition in my house. This is pretty! I used to have a purple bedroom that this would have looked perfect in! I'd love a French-inspired theme in my home. :) The pillow is great! It does have a European feel to it. I am not really into flowers and overly girly decorations but this pillow is actually really cute. It's not overly girly but still has a feminine feel to it. This is my kind of pillow! It would go ideal with the chair I saw over at Sam's Club yesterday. How cute! I love having a little touch of vintage in every room. 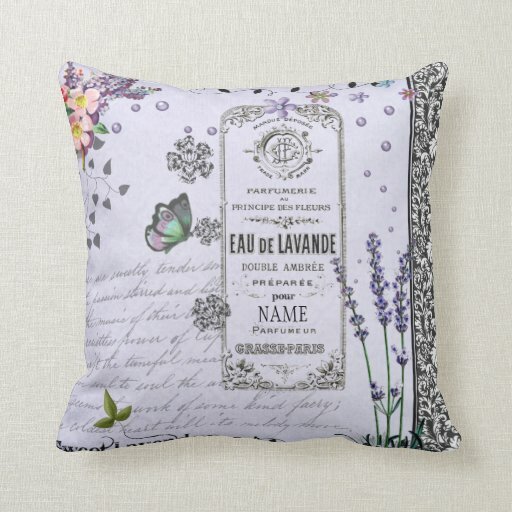 We don't have any purple themed rooms in our house but I'm sure I could find a place for a cute pillow like this.